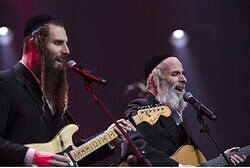 Ahead of Toronto show, Israeli hareidi music sensations reveal to local paper that Torah and music can go hand in hand. The hareidi musical duo Aryeh and Gil Gat, who wowed audiences in The Next Star, the Israeli equivalent of American Idol, are set to perform in Toronto next Thursday in a concert funded by the Jewish National Fund (JNF). Proceeds from the event will help fund a new botanical exhibit and walking path at the Ayalon Park – Canada, which is not far from Latrun. The trail, which is being built in honor of fallen IDF soldiers, will stretch for eight kilometers (about 5 miles) and be optimized for cyclers, according to Shalom Toronto.